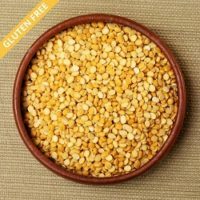 Bengal dal are considered as a vital and healthy pulse that is filled with a bunch of nutritional benefits. Just like the other pulses, chickpeas are high in protein and fiber content along with loads of vitamins and minerals. Chickpeas are high in Iron, sodium, magnesium and selenium content and they also offer a good dose of potassium and phytonutrients to the body. Feeling tired after working out or swimming? Munch on a handful of soaked or boiled chickpeas with a bit of added spices and see how the fatigue vanishes quickly. Chickpeas contain high quality plant protein that goes at per with animal protein as far as its amino acid constituents are concerned. The protein in chickpea contains the amino acid methionine in sufficient amount, which is rare amongst the plant sources and can give your muscles the right boost of energy. It has been proved through studies that people with type 1 diabetes are able to maintain a much lower blood glucose level when they consume high-fiber rich diet. In case of type 2 diabetes, fiber rich diet can be helpful for more normal blood insulin, lipid and sugar levels. Chickpeas being high in dietary fibers can be effective in offering benefits in case of both type 1 and type 2 diabetes. While intake of low sodium diet is vital for a healthy blood pressure, increasing the potassium intake is important to maintain blood pressure at a balanced level. Chickpeas being high in potassium and low in sodium can actually be helpful to control a proper blood pressure level compared to many other foods. 100 grams of chickpeas contain 875 mg of potassium, all of which can be absorbed into the body. Hence including chickpeas in your diet can ensure that you do not suffer from potassium deficiency and will also help you to maintain a healthy blood pressure level. The constituents of chickpeas are highly supportive for a better heart health. High fiber content coupled with Vitamin C, Vitamin B6 and potassium makes it a perfect food for a strong heart. Chickpeas are completely devoid of cholesterol and studies have shown that consuming sufficient amount of chickpeas on a daily basis can effectively reduce the risk of heart diseases.